Black Cop Shoves White Kid – Where's The Outrage??? A local story has social media a buzz. Let's delve into the latest story of police violence. The whole incident was captured on cell phone video which has been getting a lot of attention on social media. Middletown police said it started as a food fight between two boys in the Middletown middle school cafeteria on Tuesday. Tempers became heated and the boys decided to settle it outside. That’s where another student began recording the fight on his camera phone and moments later the school resource officer intervened. 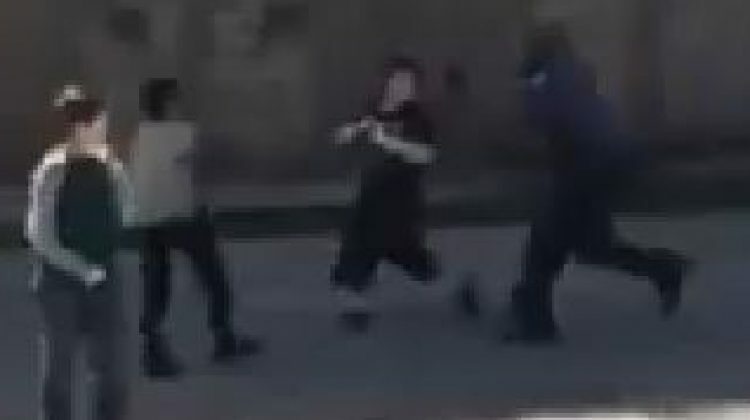 The video shows officer, Trey Porter, running up to stop the fight. According to Middletown police, one of the boys was about to throw a punch so Officer Porter pushed him in the left shoulder and the boy falls, but, the boy’s mother, Vanessa Maree, saw things differently. To me it looks more like the kid saw someone coming and just turned, almost backing off. So would I consider the officers actions excessive? Absolutely. There are a lot better ways to break up fights. Grab one kid and turn him away, or get between them. They are just kids, after all. And right there is the problem. While I do believe the officer in this incident used excessive force, a big difference is that he didn’t continue using it, or use deadly force. He pushed the kid to the ground and that was it. The officer didn’t get on the ground and start beating the kid. Other officers didn’t come jump in on the beating, as they did in California. The kid was pushed, tackled, body slammer, whatever you want to call it, and that was it. He is still alive and kicking, albeit with maybe a couple bruises and scrapes. The student who recorded the video is being disciplined, but Vanessa Maree said she’s glad he did it. “I don’t think the child who put it on Facebook should be punished. If he hadn’t of posted that I’d would have never known my child was mauled by a cop,” said Maree. Haven’t we heard this before? It seems that police and anyone in positions of authority really hates cameras. So should the kid have put this on Facebook? Probably not, but hey, that’s just a bad judgment call. Wait? Bad judgment call?!? Isn’t that the defense of the officer in this case? So how is it a young teen making a bad judgment call merits discipline, but an adult officer of the law doing the same doesn’t seem to be getting punishment? Punishing the child for exposing this excessive force is where the real outrage should be focused. If you want to get angry, get angry over the school trying to silence the whistleblower in this case. If it wasn’t for him, then we wouldn’t even know about this incident. Think about that, before jumping on the “why don’t they talk about this violent black cop” bandwagon. Oh, and one other thing. To those people claiming that Al Sharpton, the media and whoever else ignores cases of police violence against white people, remember the 10 deputies beating a guy? Yeah, that guy is white and the media and Al Sharpton have been all over it. Don’t blame them just because you been too busy digging for faux outrage that you forgot to check the actual news!